After almost three hours of testimony, Dr. Christine Blasey Ford laid bare the story that is "seared into my memory." The night that Brett Kavanaugh allegedly sexually assaulted her in 1982. And the rallying cry from high-profile women and from supporters across the country has only gotten louder. "This is not a trial for Dr. Ford. This is a job interview for Brett Kavanaugh," says Senator Diane Feinstein before submitting into evidence letters from friends and neighbors in addition to a letter signed by 1,000 physicians across the country. The letter says, "We believe she is a true patriot, risking embarrassment, intimidation, and harassment in sharing a painful and private traumatic memory in order to protect the integrity of the Supreme Court." "One of the things that's amazing is to prove to the people watching television that there's a diverse voice of people that support this woman, " says Dara Kass, the founder of FeminEM who helped organize the female physicians who sent the letter to Feinstein. "You see her law professors and her friends from high school. You see women physicians and you see everybody that walks through life stand up and say, 'I believe she is telling the truth. 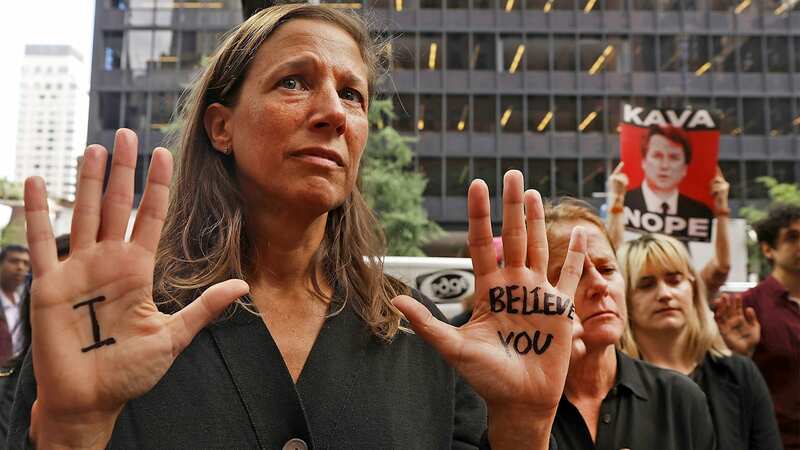 And I believe we need to support her,'" Kass told MAKERS at the New York Times New Rules Summit of the women who have supported Dr. Ford outside of politics. Kass, who founded FeminEM to empower women in the medical field, collected the signatures of women in a google doc, "like anybody can" with the help of Lindsay Fox, who wrote the letter, and a "large army" of supporters. "Women deserve to be supported in their truth and that's what we're doing." Tina Tchen, one of the founding members of the Time's Up Legal Defense Fund and former Chief of Staff to Michelle Obama, expressed hope and concern for how Dr. Ford has been treated. "My hope is that, as we've seen over the past year between #MeToo and Time's Up, that we're giving power and voice and agency to women and men that have experienced sexual violence to come forward and tell their stories." But even with progress comes worry for Tchen. "Look at what Dr. Ford has had to go through," she said. "I'm worried people will look at that and retreat back to the shadows." Through the Time's Up Legal Defense Fund, Tchen is focusing on the work and focusing on survivors. "We're going to continue to raise money," Tchen says. The fund raised $21 million dollars in its first 60 days and has received more than 3,500 requests for help. "Anybody who has paid legal bills knows, it gets expensive." Amidst the sexual assault allegations against Supreme Court nominee Brett Kavanaugh and the subsequent retaliation against clinical psychologist Dr. Christine Blasey Ford and Yale alumni Deborah Ramirez, women of Yale also penned an open letter to the public, expressing their support for sexual assault survivors. "We are coming forward as women of Yale because we have a shared experience of the environment that shaped not only Judge Kavanaugh's life and career, but our own. We are committed to supporting all women who have faced sexual assault, not only at Yale, but across the country." On Monday, Sept. 24, 600 female Yale alumna signed this letter. By Thursday, Sept. 27, there were over 2,800 signatures. The swell of support has been building all week. On Monday, Sept. 24, women across the nation from the star-studded streets of Hollywood to the steps of the Supreme Court to the arches at Washington Square Park, walked out to show their support for Dr. Christine Blasey Ford and Deborah Ramirez who have bravely come forward with their allegations against Supreme Court Nominee Brett Kavanaugh. As a part of the #BelieveSurvivors National Walkout organized by Time's Up, Planned Parenthood, NARAL Pro-Choice, and more, waves of women in black stood strong and united in solidarity of survivors of sexual assault who, for far too long, have been silenced and shamed. "I'm walking out today because I believe survivors," says protester Carley Moore. "I'm also walking out for my daughter who is 10 and for her future." The allegations of sexual assault and misconduct that have surfaced about the Supreme Court nominee have resonated with women across the nation, and they refuse to stay silent any longer. In a country where survivors of sexual assault are met with doubt and subject to shame, ridicule, and in Ford's case death threats, women are standing together to protest a culture of sexual violence against women that is all too familiar. "So many women are survivors and I think this walkout is a recognition of that," said Mandy, an NYU law student who requested to keep her last name private. "I think the stories that have come out about Judge Kavanaugh's behavior I think ring true to a lot of us with experiences that we've had in high school and college." In spite of the inevitable backlash, Ford's sense of duty to the women of America—women whose rights hang in the balance—encouraged her to come forward publicly. "These are all the ills that I was trying to avoid," Blasey said in an interview with the Washington Post. "Now I feel like my civic responsibility is outweighing my anguish and terror about retaliation." With Dr. Ford testifying before the Senate Judiciary Committee on Thursday, Sept. 27, the echoes of 1991 Anita Hill testimonies against Supreme Court Justice Clarence Thomas are hard to miss. And this time, women and men on Capitol Hill, across the nation, and Anita Hill herself are demanding that this time, we get it right. In 1991, 1,600 African-American women took out a full-page ad in the @nytimes to show support for Anita Hill. "I don't want to live in a country where this man is on the Supreme Court. It's too real for me to know what it must take for these women to come forward," said Claire Austin, the Hall Director of the NYU Freshman dormitory Goddard Hall, with tears in her eyes as she praised Ford and Ramirez. "I want them to know that they're not alone. I believe you. Thank you for finding the courage to speak. It's not an easy thing to do and I want to acknowledge that and say thank you." For any survivors looking for support or resources, you can reach out to the National Women's Law Center.